A productive day at the plate has been pretty much the norm this season for John Silviano. 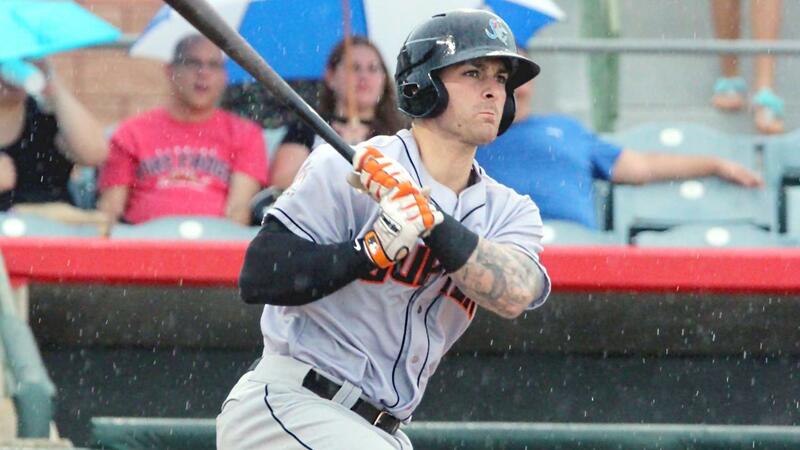 The Marlins prospect went yard twice and drove in six runs on Saturday as Class A Advanced Jupiter outslugged Daytona, 18-13, as the teams combined for 11 homers to eclipse the 29-year-old Florida State League record. It wasn't the first time Silviano had a monster performance for the Hammerheads. He drove in a career-high seven runs in another two-homer contest against St. Lucie last June 14. "After I hit the grand slam [last season], I look back and in that season, I was telling myself the same things in both games," he said. "It's pretty similar how the first two at-bats of the game went for me." Silviano has notched hits in nine of the first 10 games of the season, posting a .417 on-base percentage. He went 3-for-5, while rehabbing Marlins catcher J.T. Realmuto was 3-for-3 and fell a triple shy of the cycle. Silviano's last two-homer game came after he worked in the batting cages with Justin Bour, another Marlin who was rehabbing with Jupiter. Having a Major Leaguer around was something Silviano didn't take lightly in either instance. "He's a really good guy," he said of Realmuto. "It was good to be able to pick his brain a little bit. Having a little experience at the big league level and success there, he's a good guy to learn from and a good guy overall. It was fun." Silviano's seven RBIs in last year's contest all came on long balls -- a three-run dinger and a grand slam. In Daytona, his production was spread over two homers and a single. He launched a two-run shot in the second inning and a grand slam in the fifth. Both homers came on fastballs on the outside half of the plate. "I was just trying to stay relaxed," Silviano said. "I was trying to not do too much and not get too caught up in the situations I was in. I just wanted to see the ball." The historic nature of the contest wasn't lost on Silviano. When the scoreboard showed the home run record, it brought more meaning to his special night at the plate. "It's pretty unbelievable," he said. "It was a lot of fun to be a part of. I don't think I've ever been a part of a game that was that much of a back-and-forth slugfest between both teams. I'm happy that we came out on top and came out with the win, but overall, it was a fun time." The Florida native slugged a career-high 13 homers last season, his first full year in the FSL. He batted .245 with the Hammerheads, driving in 55 runs and striking out 127 times. Selected by the Blue Jays in the 13th round of the 2012 Draft, Silviano was released by the organization and went on to play baseball with Lynn University in 2015. He signed with the Marlins following a season in which he hit 31 homers and a 1.500 OPS. He was able to play in college following his pro debut due to a loophole that allows players to go to Division II even after signing out of high school. "A scout called me and let me know that there's this rule, because I wasn't even aware of it at first," he said. "I didn't know what I was going to do or where I was going to play, and he told me you're able to go back, but it has to be D-II, it couldn't be D-I or JuCo or anything." Stone Garrett went 3-for-6 with two homers and four RBIs, while Marlins No. 18 prospect Joe Dunand also drove in four runs. Mitch Nay crushed two homers and drove in five runs for the Tortugas. Daytona also got roundtrippers from Daniel Sweet, Dilson Herrera and Reds No. 3 prospect Taylor Trammell. The previous FSL record for homers in a game was 10, set by St. Petersburg and Dunedin on July 30, 1989.